[5 mins. 20 secs.] In this jam-packed episode of the podcast I first welcome back long-time friend of Filmwax, filmmaker and commercial director, Adam Reid, who appeared way way back in Episodes 15 & 38 with his feature film, "Hello Lonesome". Adam is back to discuss the Kickstarter campaign for his latest project, "Barry & Joe: The Animated Series" which is where Barack Obama and Joe Biden are sent back in time by Neil deGrasse Tyson. Bromancing the multiverse to save us from ourselves. [39 mins. 45 secs.] When I was at the Maryland Film Festival this Spring I was fortunate enough to see a dark comedy called "Lemon". The film concerns Isaac' Lachman (guest Brett Gelman) whose blind girlfriend walks out on him, as his life goes into free fall. We follow Isaac as he directs an unhinged staging of Chekhov's "The Seagull," attends the Passover Seder from hell, and attempts to woo a new flame. 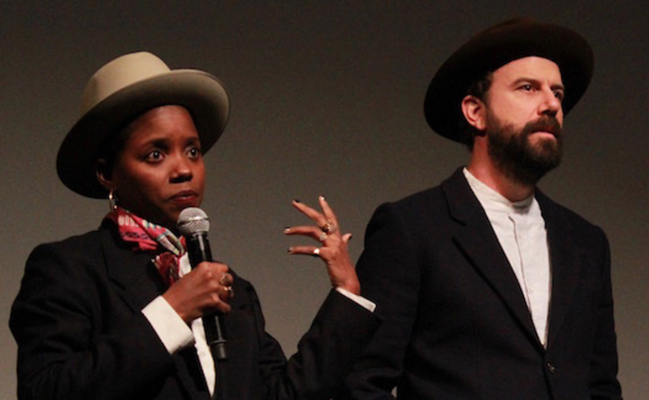 Gelman, who co-directed and stars is joined by his partner Janicza Bravo, director of "Lemon". The film, which is being distributed Magnolia Pictures and which also stars Judy Greer, Michael Cera and Nia Long, opens in Los Angeles, on iTunes, Amazon Video and on demand on Friday, August 18th, then in NYC on Friday, August 25th. [1 hr. 8 mins. 55 secs.] Last up, the team behind the Sundance 2017 break-out hit, "Patti Cake$": filmmaker Geremy Jasper, and actors Danielle McDonald and Cathy Moriarty ("Raging Bull"). In a coming-of-age story straight out of Jersey, an unlikely rapper finds her voice as a one-of-a-kind hip-hop legend in the making in Patti Cake$, the first feature film from acclaimed commercial and music-video director Jasper. Set in gritty strip-mall suburbia, the film which is being distributed by Fox Searchlight and opens wide August 18th, chronicles an underdog’s quest for fame and glory with humor, raw energy and some unforgettable beats.